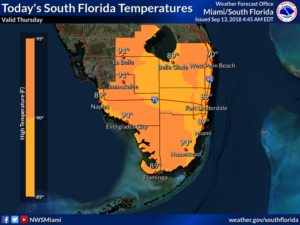 South Florida will see mid-September heat and passing showers on Thursday, while the outer bands of dangerous Hurricane Florence reach the Carolinas. 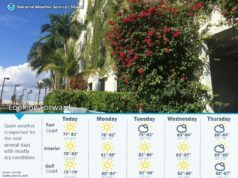 Here at home, Thursday features sun, clouds, and passing showers (with maybe a stray storm) at times. Watch out for an increasing risk of dangerous rip currents, especially along the coast of Palm Beach County. 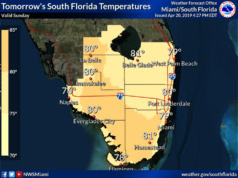 Highs on Thursday will be near 90 degrees. 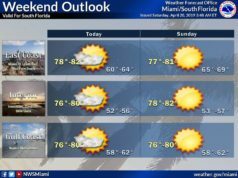 Friday will bring sun, clouds, and passing showers in spots. Friday’s highs will be near 90 degrees. Look for more widespread showers and a few storms on Saturday, especially in the east coast metro area. 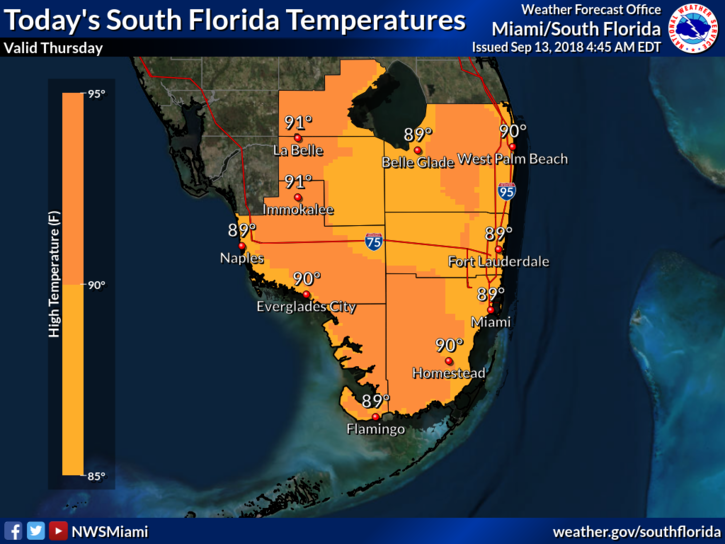 Saturday’s highs will be in the low 90s. Sunday will feature sun, clouds, periods of showers, and a storm in spots. 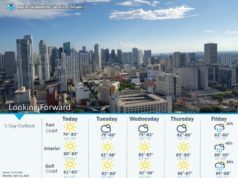 Sunday’s highs will be in the low 90s. Monday’s forecast includes early east coast showers, sun and clouds, and afternoon sea breeze showers and storms, especially in the interior and Gulf coast. 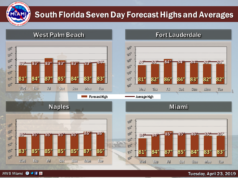 Highs on Monday will be near 90 degrees. Hurricane Florence will bring life-threatening storm surge and devastating flooding to parts of the Southeast in what is shaping up to be a major disaster. 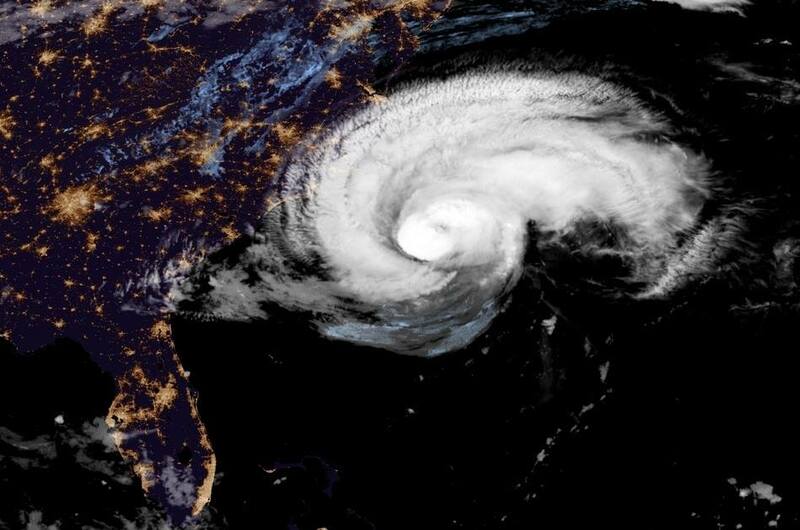 At 5 am Thursday, Florence was located near 32.8 North, 74.7 West, about 200 miles from Wilmington, North Carolina. 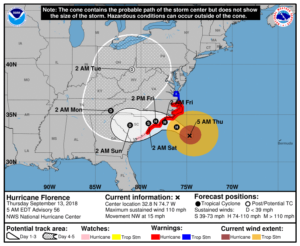 Florence was moving northwest at 15 miles per hour and had maximum sustained winds of 110 miles per hour. 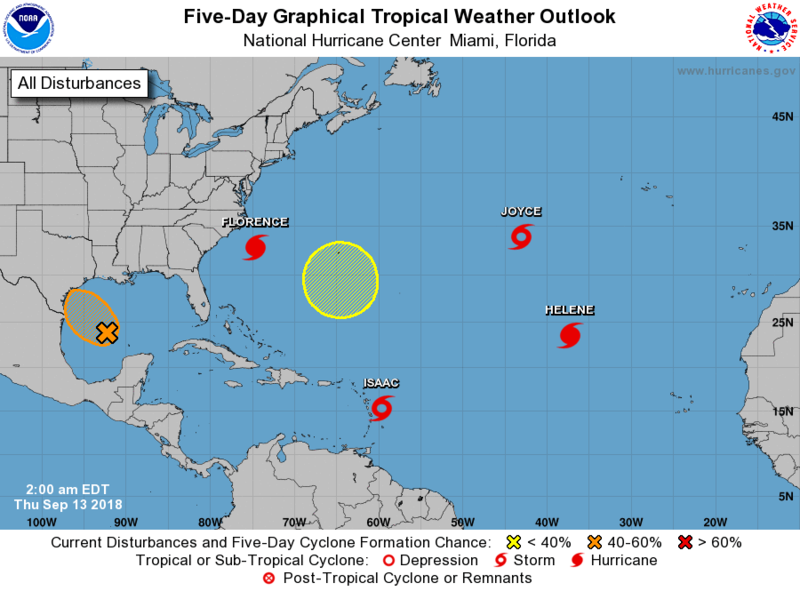 Florence’s projected path will bring hurricane conditions to the North and South Carolina coasts for a prolonged period. 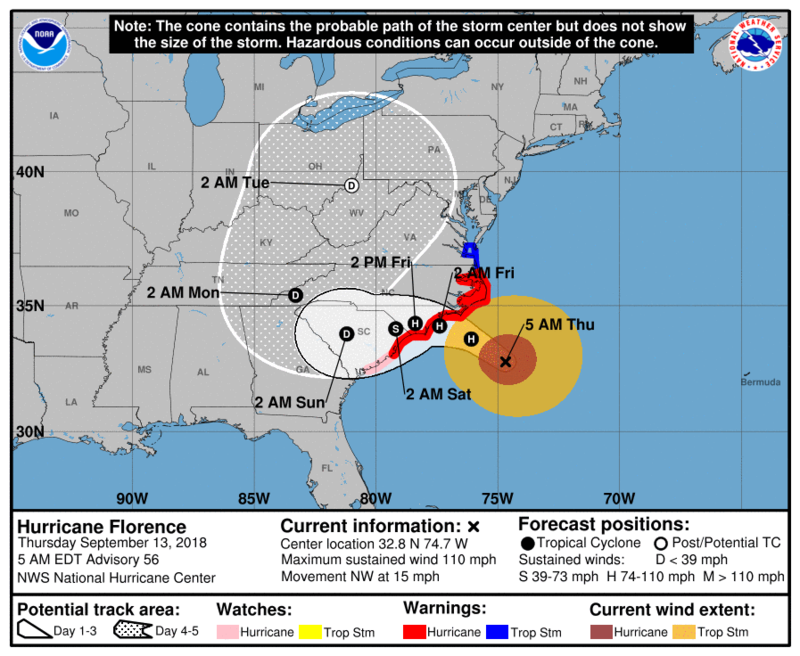 Florence’s slow trek inland will bring up to 30 inches of rain over the region, with isolated locations possibly getting up to 40 inches of rain. 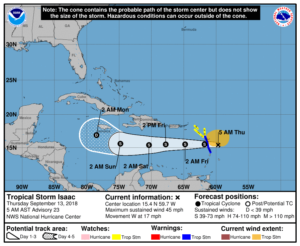 Tropical Storm Isaac is approaching the Leeward Islands, bringing strong winds and heavy rains. At 5 am Thursday, Isaac was located near 15.4 North, 59.7 West, about 100 east of Dominica. Isaac was moving west at 15 miles per hour and had maximum sustained winds of 45 miles per hour. 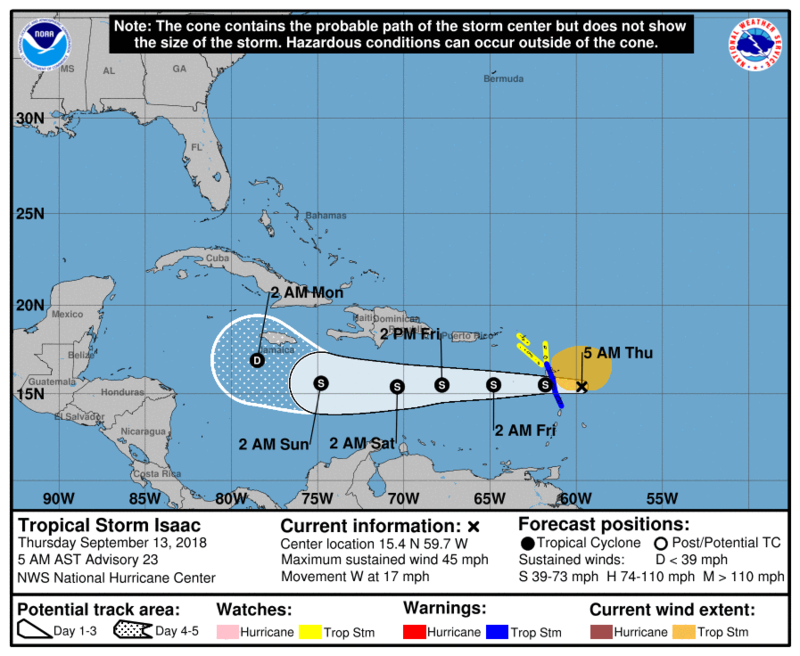 Isaac is likely to weaken into an open wave in 4 days, but there is the possibility it could regenerate in the western Caribbean. We’ll watch to see what happens. 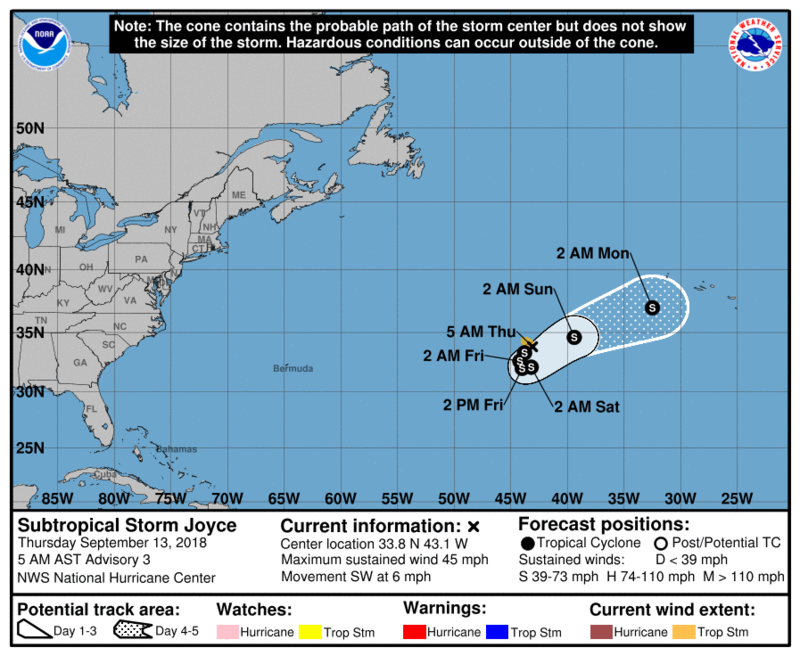 Elsewhere, we now have Tropical Storm Joyce in the open Atlantic, along with a weakening Hurricane Helene. 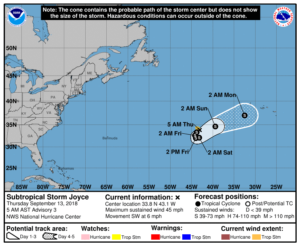 First, to Joyce — which at 5 am Thursday was located near 38.3 North, 43.1 West, and was moving southwest at 6 miles per hour. 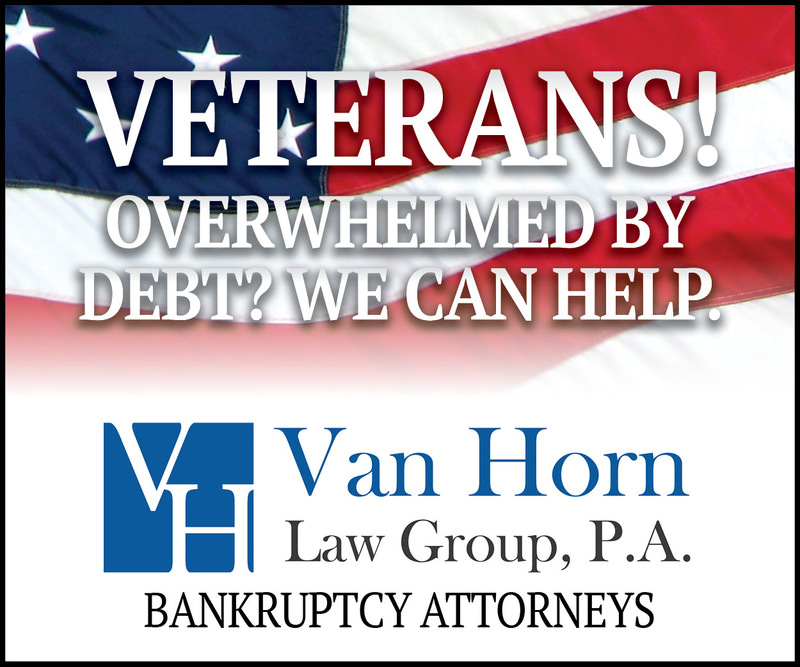 Maximum sustained winds were 45 miles per hour. 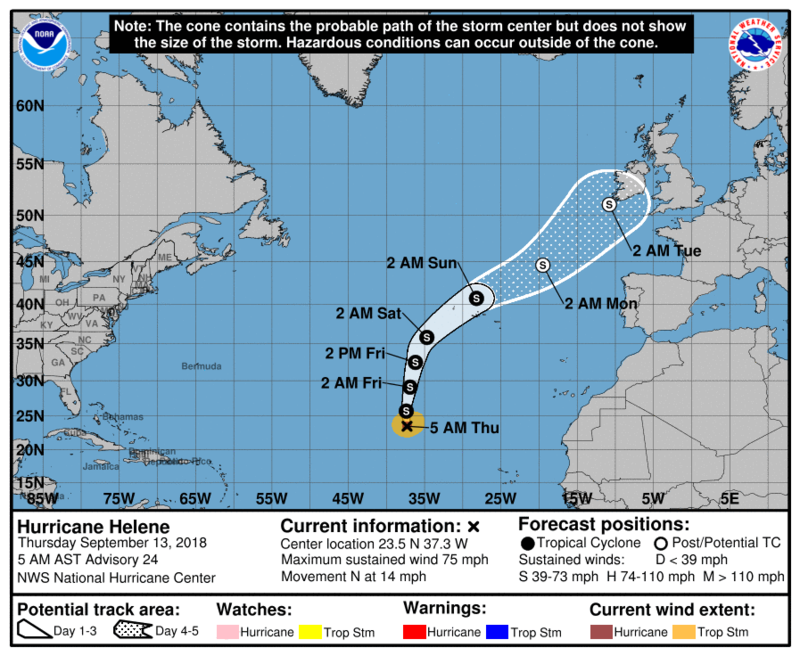 Helene was located near 23.5 North, 37.3 West, and was moving north at 14 miles per hour. 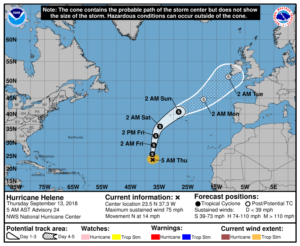 Maximum sustained winds in Helene were down to 75 miles per hour. Neither system is a threat to land. And finally, the low pressure in the central Gulf of Mexico has a medium chance of becoming a tropical depression before it reaches the coast of Texas or northeastern Mexico later in the week. In any case, it will bring heavy rain and gusty winds to the region.